Fermentation analyses have long been used in university and industry research trials to assess silage quality. These analyses are now available for evaluating silage quality on farms through commercial forage testing laboratories. Analyses commonly included in silage fermentation reports are pH, lactic, acetic, propionic and butyric acids, ammonia, and ethanol. The purpose of this Focus on Forage is to answer the most frequently asked questions about the interpretation and use of these reports. 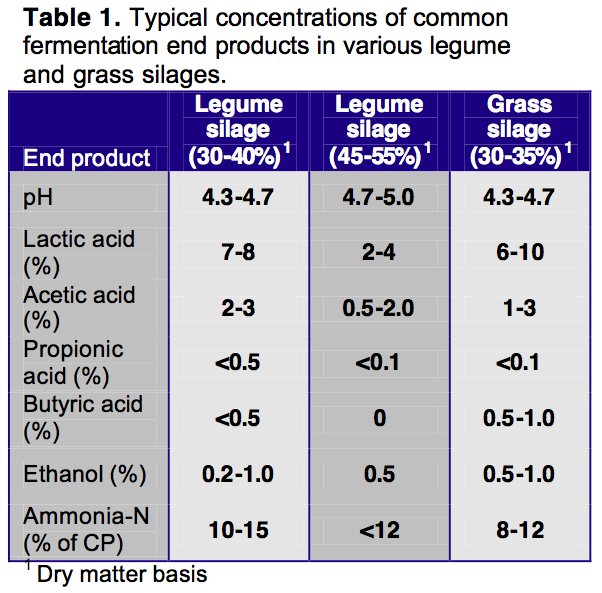 What do these reports tell us about the fermentation process and silage quality? Collectively, data from a fermentation analysis can tell us whether an excellent, average, or poor fermentation has occurred. Based on these analyses, we can usually make some educated assumptions about the kinds of microorganisms that controlled the ensiling process. In many, but not all cases, the fermentation that a crop undergoes can be explained by various crop factors such as moisture content, buffering capacity, and sugar content. However, management factors such as silo packing speed, silage pack density, type of additive used, chop length, silo management during storage, and silo management during feed-out can affect fermentation analyses. In some cases fermentation analyses can qualitatively explain poor silage nutritive value or low intakes, but they cannot be used to balance diets for cattle. Thus, they should always be used in conjunction with other standard chemical analyses (i.e. ADF, NDF, CP, RDP/RUP, NEL, NDF digestion, etc.). Tables 1 and 2 provide the normal ranges for fermentation end products. What does a high pH value tell us about the fermentation process and silage quality? The pH of an ensiled sample is a measure of its acidity, but is also affected by the buffering capacity of the crop. Two samples may have the same pH, but different concentrations of acids. In general, legume silages have a higher pH than corn or other grass silages and take longer to ensile because of their higher buffering capacity. Seldom do corn silages have a pH higher than 4.2. Such cases may be associated with extremely dry (>42% dry matter) silages that are overly mature or drought stricken. Because of its normally low pH (3.8), corn silage intake usually benefits from the addition of sodium bicarbonate prior to feeding to neutralize its acidity. Common reasons for legume silages having a pH higher than 4.6 to 4.8 include: ensiling at <30% dry matter (DM) which causes a clostridial fermentation, and ensiling at >45-50% DM, which restricts fermentation. In the first example, a high pH due to clostridia is a definite indicator of an undesirable fermentation that has led to poor quality silage. However, in the second example, a high pH due to restricted fermentation is not always indicative of a poor fermentation or poor silage. But, silage from a restricted fermentation usually is unstable when exposed to air because insufficient amounts of acid were produced to inhibit secondary microbial growth. What does buffering capacity mean and what does it tell us about silage quality? Buffering capacity measures to what degree a forage sample will resist a change in pH. All forages have different buffering capacities. Fresh forage with a high buffering capacity will require more acid to reduce its pH than forage with a low buffering capacity. In general, fresh legumes have a higher buffering capacity than do fresh grasses or corn. What does a low lactic acid concentration tell us about the fermentation process and silage quality? Lactic acid should be the primary acid in good silage. This acid is stronger than the other acids in silage (acetic, propionic, and butyric), and therefore is usually responsible for most of the drop in silage pH. Further, fermentations that produce lactic acid result in the lowest losses of DM and energy from the crop during storage. Some common reasons for low lactic acid content include the following. Restricted fermentation due to high DM content (especially legumes and grasses with >50% DM). Restricted fermentation due to cold weather. Sample taken after considerable aerobic exposure that has degraded lactic acid. Silages high in butyric acid (Clostridial silages) are usually low in lactic acid. Lactic acid should be at least 65 to 70% of the total silage acids in good silage. What does high acetic acid concentration tell us about the fermentation process and silage quality? Extremely wet silages (<25% DM), prolonged fermentations (due to high buffering capacity), loose packing, or slow silo filling can result in silages with high concentrations of acetic acid (>3 to 4% of DM). In such silages, energy and DM recovery are probably less than ideal. Silages treated with ammonia also tend to have higher concentrations of acetic acid than untreated silage, because the fermentation is prolonged by the addition of the ammonia that raises pH. A new microbial inoculant (Lactobacillus buchneri) designed for improving the aerobic stability of silages causes higher than normal concentrations of acetic acid in silages. However, production of acetic acid from this organism should not be mistaken for a poor fermentation and feeding treated silages with a high concentration of acetic acid does not appear to cause negative effects on animal intake. What effect does silage with a high acetic acid concentration have on animal performance? The effect of high concentrations of acetic acid (>4-6% of DM) in silages fed to animals is unclear at this time. In the past, some studies found that DM intake was depressed due to high acetic acid silage when fed to ruminants. However, the depressed intake due to high acetic acid in the diet has not been consistent. There has been speculation that decreased intake may be actually due to unidentified negative factors associated with a poor fermentation and not to acetic acid itself. For example, in recent studies, animals showed no indication of reduced intake when fed silages high in acetic acid due to inoculation with the bacteria Lactobacillus buchneri for improved aerobic stability. If a producer has intake problems due to silages with excessively high acetic acid (>5-6% of DM), the amount of that silage should be reduced in the TMR. Other alternatives for managing these silages include: aerating the silage for a day to volatilize the acetic acid, removing the silage and then gradually reincorporating it back into the diet over a 2–3 week period, and partially neutralizing the silage with sodium bicarbonate prior to feeding (about 0.5 to 1% addition on DM basis). What does silage acid concentration tell us? Most silage contains very low concentrations of propionic acid (<0.2 to 0.3%) unless the silage is very wet (<25% DM). In silages with more typical concentrations of DM (35 to 45% DM), concentrations of propionic acid may be undetectable. Are there additives that can increase the propionic acid concentration of silage? Biological additives that theoretically increase the propionic acid concentration of silage usually contain bacteria from the Propionibacteria family. However, research suggests that these organisms are usually unable to compete in normal silage environments and are thus, usually ineffective. Chemical additives containing propionic acid are more effective at increasing the concentration of this acid in silages. These additives can range markedly in their percentage of active ingredients but most mainstream products will increase the concentration of propionic acid at ensiling from 0 to about 0.15 to 0.30% (DM basis) if added at 2 to 4 lb per ton of wet (~35% DM) silage. What does a high butyric acid concentration tell us about the fermentation process and silage quality? A high concentration of butyric acid (>0.5% of DM) indicates that the silage has undergone clostridial fermentation, which is one of the poorest fermentations. Silages high in butyric acid are usually low in nutritive value and have higher ADF and NDF levels because many of the soluble nutrients have been degraded. Such silages may also be high in concentrations of soluble proteins and may contain small protein compounds called amines that have sometimes shown to adversely affect animal performance. What effect does silage with high butyric acid concentration have on animal performance? High butyric acid has sometimes induced ketosis in lactating cows and because the energy value of silage is low, intake and production can suffer. As with other poor quality silages, total removal or dilution of the poor silage is advised. What does a high ammonia concentration tell us about the fermentation process and silage quality? High concentrations of ammonia (>12 to 15% of CP) are a result of excessive protein breakdown in the silo caused by a slow drop in pH or clostridial action. In general, wetter silages have higher concentrations of ammonia. Extremely wet silages (< 30% DM) have even higher ammonia concentrations because of the potential for clostridial fermentation. Silages packed too loosely and filled too slowly also tend to have high ammonia concentrations. What effect does silage with high ammonia concentration have on animal performance? Theoretically, high amounts of ammonia (by itself) in silage should not have negative effects on animal performance if the total dietary nitrogen fractions are in balance. However, if the high ammonia contributes to an excess of ruminally-degraded protein (RDP), this could have negative consequences on milk and reproductive performances. Blood or milk urea nitrogen can be used as an indicator of excess RDP. Often times, silage with high concentrations of ammonia coupled with butyric acid may also have significant concentrations of other undesirable end products, such as amines, that may reduce animal performance. What is high ethanol concentration and what does it tell us about the fermentation process and silage quality? High concentrations of ethanol are usually an indicator of excessive metabolism by yeasts. Dry matter recovery is usually worse in silages with large numbers of yeasts. These silages are also usually very prone to spoilage when the silage is exposed to air. 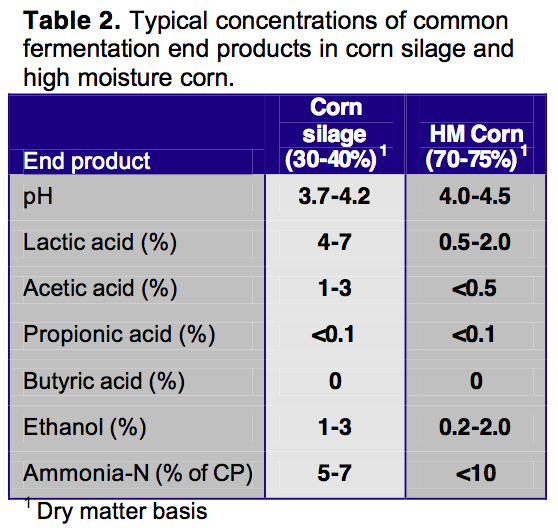 Usual amounts of ethanol in silages are low (< 1 to 2% of DM). Extremely high amounts of ethanol (> 3 to 4% of DM) in silages may cause off flavors in milk. Can silage fermentation reports be used to help in balancing of diets for dairy cattle? We know of no acceptable method that uses silage fermentation analyses for balancing nutrient requirements for dairy cattle. How can silage fermentation reports be used for troubleshooting animal performance problems? Assuming that all nutrients are balanced properly in the diet, silage fermentation reports may be able to identify the reason for intake or performance problems. Can silage fermentation reports tell us whether or not a silage additive worked? Usually not, unless done in a well controlled research trial. However, one might be able to tell if a propionic acid product were added to silage since most silages typically are low in this acid. If silage was treated with about 2 lb/ton of fresh forage using a buffered propionic acid product, one might be able to detect the increase in this acid. Most silages have < 0.15% propionic acid. How should silage samples be taken for fermentation analysis? If your goal is to evaluate what animals are being fed, then samples should be reflective of this by sampling at feeding. If your goal is to see what type of fermentation process the silage went through, then collect a sample that is a fresh as possible and that has not been exposed to air (typically at least 8 to 10 inches below or beyond the face). How should silage samples be handled and shipped for fermentation analyses? For chemical fermentation analyses, samples should be frozen immediately after being taken, then shipped preferably on ice in a cooler by a next day delivery service. Ship at the beginning, not end of the week so samples will not be held up during the weekend. What commercial testing laboratories perform silage fermentation analyses? Current information on analytical costs and sample turn-around times is best obtained directly from the individual labs.